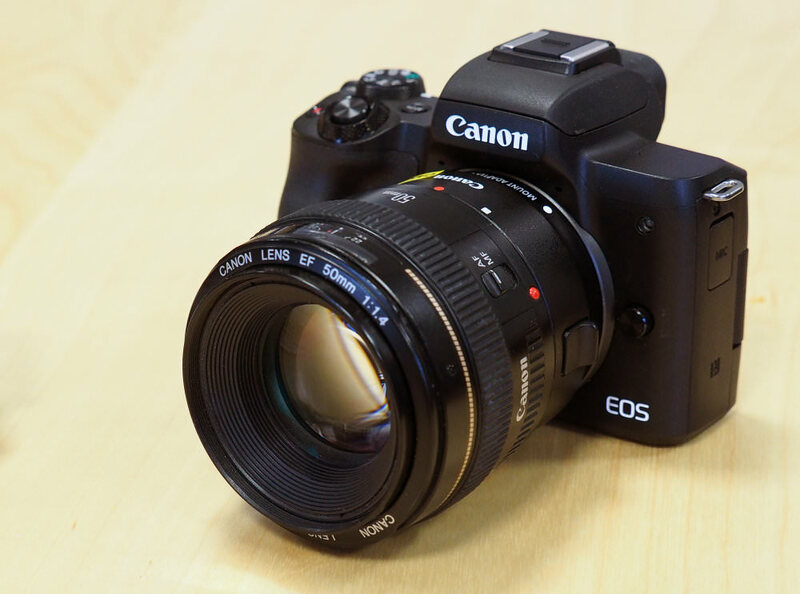 We review the new Canon EOS M50, Canon's entry level DSLR-style mirrorless camera, with some high-spec features, including 4K video, eye-detection focus and high ISO speeds. 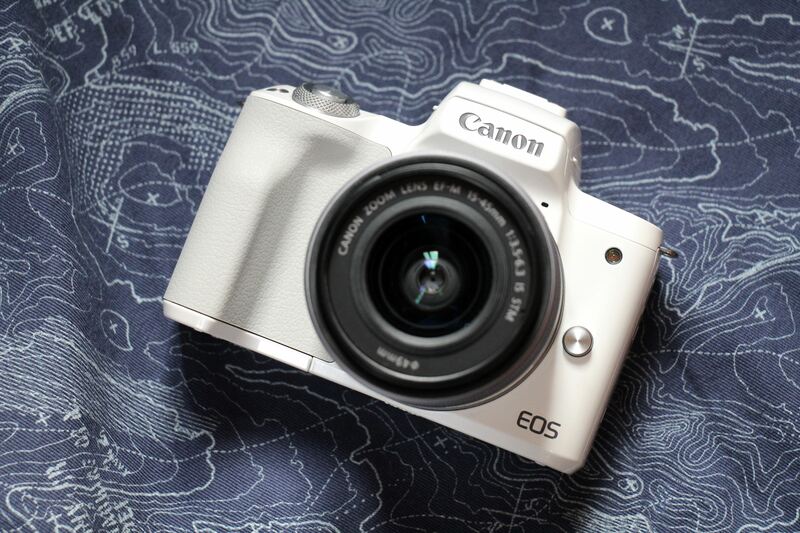 The Canon EOS M50 is Canon's latest mirrorless camera with built-in electronic viewfinder (EVF), and features a 24mp APS-C CMOS sensor, 10fps continuous shooting, 4K video recording, and face-detection focus. 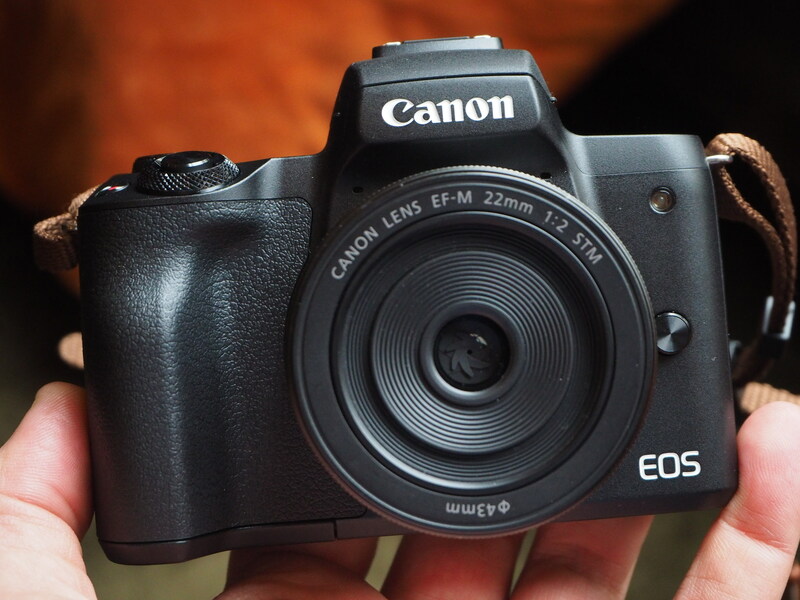 The Canon EOS M50 is available for £539 body only. 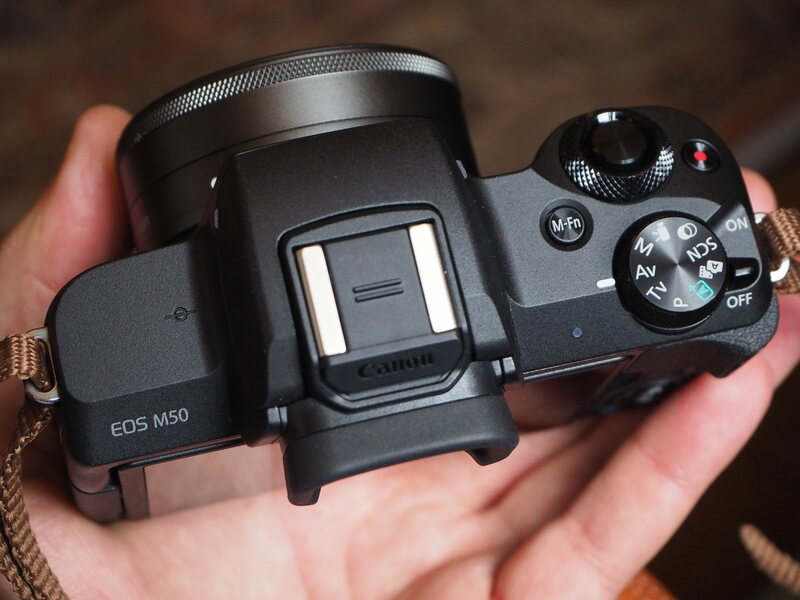 The Canon EOS M50 is Canon's entry-level premium mirrorless camera and sits below the M5, and M6, with fewer external controls. However, internally it is an upgrade, as the camera offers a new 24.1mp APS-C CMOS sensor, with updated dual-pixel AF, 143 AF points (with larger coverage), and 4K video recording, along with a mic socket. Also new to Canon, is eye-detection auto-focus, making this one of the most innovative Canon cameras currently available. The M50 is compact and features a 3inch vari-angle touch-screen. It's compatible with EF-M (EOS-M) lenses, and there are currently 7 lenses available from Canon, ranging from 11mm to 200mm. If you want to use Canon EF lenses, then you can use the Canon Mount Adapter EF-EOS M, which we used with the Canon EF 50mm f/1.4 lens. 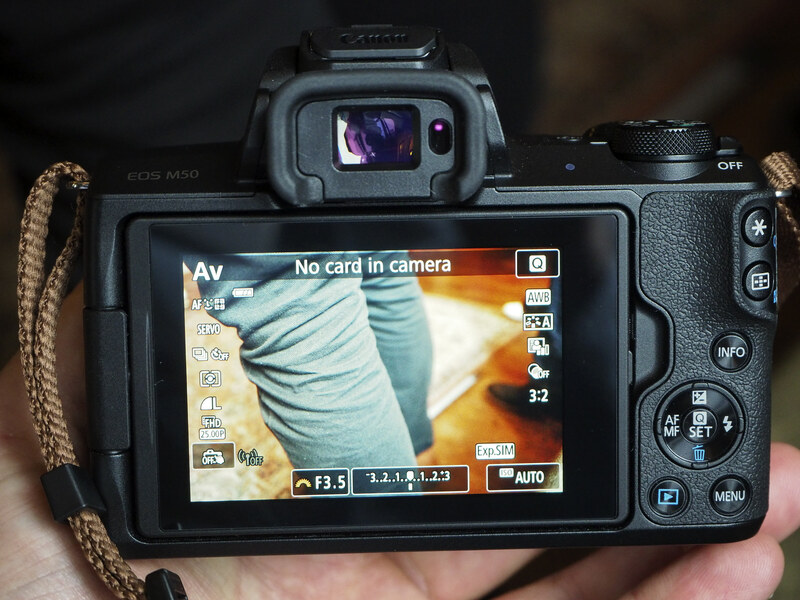 The EOS M50 features the updated guided user interface of the Canon EOS 800D, making it easier to use for beginners. You can also use the touch-screen to change settings and go through the menu system. If you're more familiar with Canon's normal menu system, then you can easily switch back to the standard menus. The camera offers P, A (Av, aperture priority), T (Tv shutter priority), M, Auto, Hybrid, Scene, Creative and Video shooting modes. The scene modes available include:- Self-portrait, Portrait, Smooth skin, Landscape, Sports, Close-up, Food, Panning, Handheld Night Scene, HDR backlight control, and Silent mode. There are a number of creative effects, including - Grainy B/W, Soft focus, Fish-eye effect, Water painting effect, Toy camera effect, Miniature effect, HDR art standard, HDR art vivid, HDR art bold, and HDR art embossed. Touch and drag AF - whilst looking through the electronic viewfinder (EVF), you can use the touch-screen to move the focus position. Wi-Fi, Bluetooth, and NFC are all built-in making it easy to set up a connection to your smartphone, and transfer images, as well as control the camera. 4K (UHD) video is recorded at a resolution of 3840x2160 at 25fps and features 4K time-lapse recording, and lets you save still images from video. 4K video recording has a 1.56x crop, which increases to 1.75x with digital image stabilisation (IS) enabled, or 2.26x crop with enhanced IS. The electronic viewfinder (EVF) has a high resolution of 2.36million dots and a quick refresh speed. The camera also offers high-speed video recording, at 100fps and a resolution 1280x720 (720p). The time-lapse video mode can record a FullHD or 4K video. The Canon EOS M50 has a solidly built plastic body, that feels reasonably solid. The grip on the right-hand side is very good, giving a textured, rubberised area to hold on to, and this also provides a solid area on the back for your thumb to grip on to. The metal tripod socket is in the middle of the camera and lines up with the middle of the lens. The memory card and battery compartment isn't locking but stays in place. It feels a little flimsy, but shouldn't cause any real issues, as it has a metal backing that is spring loaded. The top dials (of which there are two) are both made out of metal and textured with a grippy surface. The buttons are a good size, except for the Wi-Fi button on the right-hand side, which is a little small, most likely so that you don't accidentally press this. The 4-way controller with middle Q/Set button is also on the small size, and if you have large hands it may take some time to get used to this. The layout of controls means that you can easily reach all of the buttons when holding the camera with one hand. The touch-screen can be used to set the focus position. There are 143 / 99 focus points (depending on lens used), and you can set the focus point to almost anywhere on the screen, except for the very edges of the screen. Focus works well, with the focus assist lamp helping in low-light. Focus peaking is available when using manual focus. The screen quality is good, with a gapless design, with good viewing angles. The screen can be turned inwards so that when you close it, it protects the screen from scratches. Colour reproduction is very good, and the EVF and screen both match each other for brightness and contrast, although the view in the EVF is slightly more saturated. The electronic viewfinder (EVF) has a high resolution and looks good, although is quite small compared to more expensive mirrorless cameras. 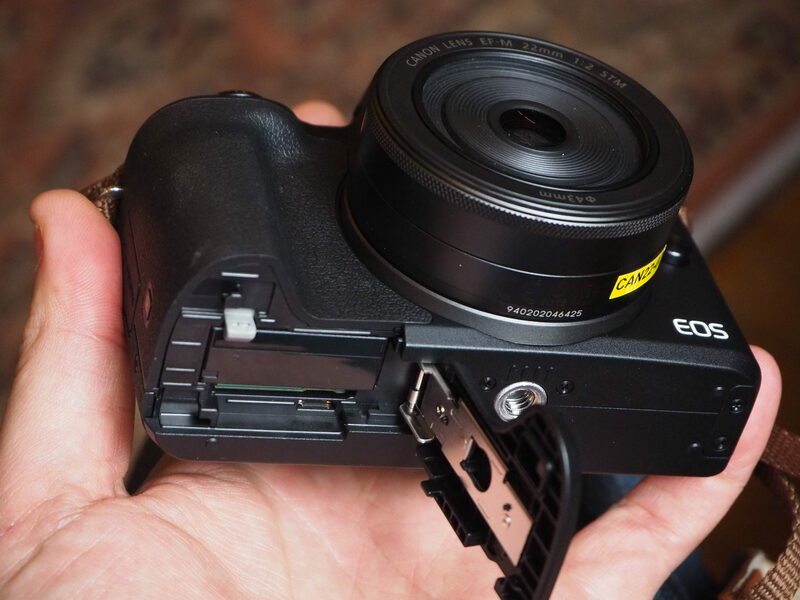 The camera will automatically switch between the rear screen and the EVF when you hold the camera up to your eye. The rubber surround is comfortable whether you're wearing glasses or not, and there is dioptre correction under that can be adjusted. Menus – The new guided menu system can easily be switched off if you’re already used to Canon’s menu systems. If you’re not, the guided menu system is clear and easy to use, with brighter text and larger icons. If you go for the standard menu system, this is clear and well laid out, and you can use the touch-screen with both menu systems. The Q button gives quick access to settings, and these can also be changed with the touch-screen. Canon has introduced a new raw format: CR3 (14bit) which produces a 28.9mb raw file. They've also introduced C-Raw (compressed raw), which gives a 16mb raw file, although the size is likely to vary depending what's in the shot. You'll need to use Canon's provided software to process these raw files, as Adobe Photoshop does not yet support these new raw formats. Wi-Fi features - Setting up a connection to your smartphone or tablet is relatively easy. As the app, Canon Camera Connect guides you through the process making it as easy as possible for you. Once set up, it’s easy to transfer images over, as well as remotely control the camera. You can also use the app to add location information to your photos. Bluetooth allows low-power transfer of images, without draining the battery as much as Wi-Fi. Battery life - Battery life is rated at 235 shots according to Canon / CIPA test results, which can be extended to 370 shots with ECO mode switched on. Because of the relatively low battery life on standard settings, we'd recommend purchasing a second battery. When comparing the number of lenses available for this little camera consider combining the offerings from Panasonic and Olympus and just call it micro 4/3. Then you have an ecosystem with 65 lenses and that's not counting any 3rd party offerings. [quote]When comparing the number of lenses available for this little camera consider combining the offerings from Panasonic and Olympus and just call it micro 4/3. Then you have an ecosystem with 65 lenses and that's not counting any 3rd party offerings. [/quote] And the fact there are no third party lenses for the M mount might also suggest there has [at least up to now] been little confidence from others to match Canon's meagre commitment to the format. Perhaps once they release their larger format mirrorless we'll start to see a change. The M5 does look like the first offering from Canon that's both viable from a usage PoV and decent value [although perhaps still frustratingly compromised]. It is [b][i]very[/i][/b] late to the party. Quote:When comparing the number of lenses available for this little camera consider combining the offerings from Panasonic and Olympus and just call it micro 4/3. Then you have an ecosystem with 65 lenses and that's not counting any 3rd party offerings. And the fact there are no third party lenses for the M mount might also suggest there has [at least up to now] been little confidence from others to match Canon's meagre commitment to the format. Perhaps once they release their larger format mirrorless we'll start to see a change. 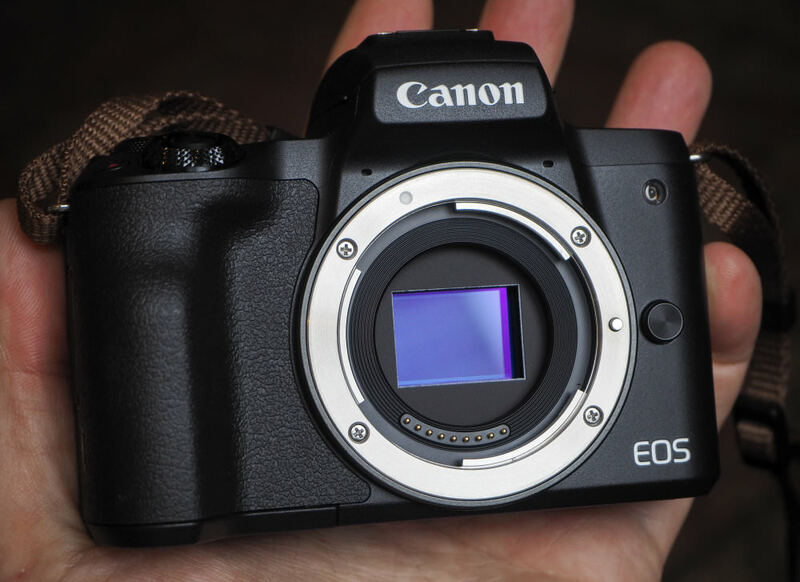 The M5 does look like the first offering from Canon that's both viable from a usage PoV and decent value [although perhaps still frustratingly compromised]. It is very late to the party. The AF is the key feature, this is the perfect vlogging camera. Olympus has poor AF and Panasonics are hopeless! MFT lenses are becoming very expensive too. The M lenses are limited but you can adapt EF and EF-s lenses to the M50 giving a huge range to choose from with a thriving second hand market. At this price, you cant go wrong, I will buy it for definite. Actually I’m surprised it gets only 4/5 for value. Its got a great sensor, digic 8 firmware and 145 point dual pixel AF for the price of a lower level bridge camera !